In our region of Axarquia, as with most regions in Spain, most food is seasonal, local and fresh, although the growing season for some foods is pretty much year round due to the weather. Wherever possible we source our ingredients from local suppliers and in some cases directly from our own land or our neighbouring farmers. Goats cheese is a local speciality and occasionally you will see the goat herders taking their flock next to The House of Oranges to drink from the stream. There are also many other local cheeses available which are a must try. Meat is sourced locally and is very much on a ‘what's available’ basis. Fish is a regular on the menu and a local speciality “gambas pil pil” (prawns cooked in a bubbling sauce) has to be tried. Iberico pork and cured meats are to be found in most restaurants and bars along with the many tapas dishes. 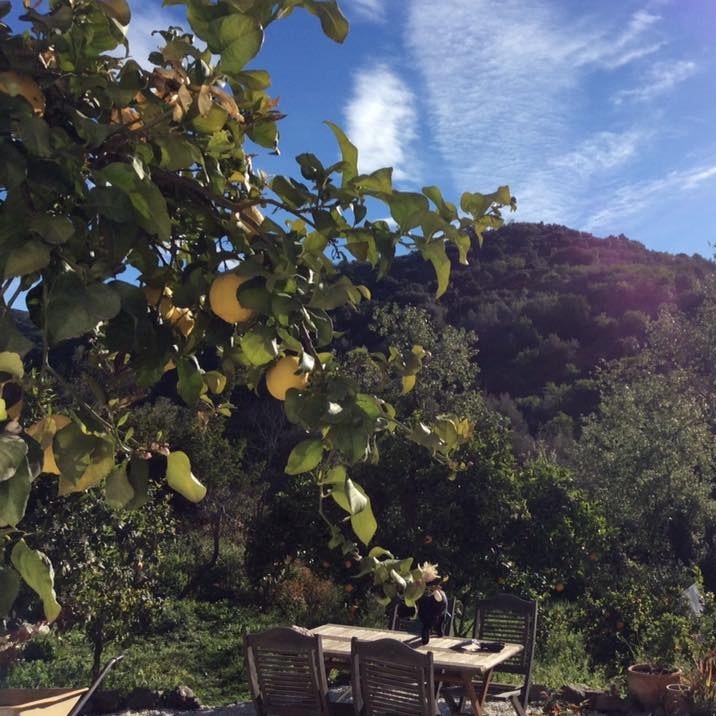 As you might expect we have many fruit trees, in particular orange and lemon trees. The valley we’re set in is known to some locally as the “green valley” due to the unique climate and availability of water from the mountain-spring fed river than runs through it, along with 320 days of sun a year that allow the fruit trees to flourish. In addition to oranges and lemons we have pomegranate, figs, nispero (Japanese medlar fruit), persimmon, almonds, olives, peaches, avocados, and prickly pears that grow on the cacti (but watch out for the prickles!) Wild herbs especially fennel grow in abundance. You're free to pick whatever is ripe on our land whenever you want so no excuse for not getting your five a day!